Three things I strongly suspect are true about graphic novelist James Sturm: he is or has been married, he has kids, he doesn't have a dog head. Of the three, I'm least certain of the last. I also really, really hope he didn't vote for Jill Stein instead of Hillary Clinton in 2016, but honestly I have no idea. The latter comment is oddly central to Off Season, a graphic novel set in the aftermath of the 2016 US presidential election, which both frames and represents the marital turmoil of the novel's plot. From the opening panel of a turn-right traffic arrow painted on black asphalt below the caption-boxed chapter title "Stronger Together", American politics infuse the story. Like the visual echo of the arrow embedded in the "H" of the Hillary yard sign seen in the next panel, the unglossed slogan references not only the failed Clinton campaign but also the narrator's failing marriage, ironically encapsulating his own most salient feature: he needs his family to be together in order to be the strongest (or even a tolerable) version of himself. The 16 chapters range between three- to 15-two-panel pages, arranged left-to-right from an atypically short spine—the equivalent of "landscape" rather than "portrait" orientation. It may or may not be coincidental that Lynda Barry's One! Hundred! Demons! (2005) shares the same format, since Barry's memoir was originally published online as an episodic series at Slate in the late '90s, ending with the traumatic impact of Al Gore's ambiguous loss to George W. Bush in the wake of the Florida recount. Slate featured Sturm's episodic chapters beginning in early October 2016—and so just before Clinton's unexpected loss. The seventh chapter of Off Season (the sixth online) was published on the day of the 2016 US Presidential election, the same day as within the story. The chapter title "Is It Really Over?" becomes the more definitive "It's Not Over"—though the narrator's stumbling marriage, like the election results, asks the same question. The ninth and final online installment of Sturm's work is the most revised in book form, as the narrator's breakdown peaks with his (undrawn) vandalism of a construction site after the repeatedly late paycheck from his conman of a boss bounces, resulting in his daughter getting thrown out of her Judo class and an angry text from his not-quite-yet-ex-wife. It's a pretty bleak moment with which to end the original series, since the cop car in his rearview mirror is there to arrest him—except in the graphic novel, we learn later that he was only pulled over for texting while driving. While the new chapters are not as up-beat as the title of the next, "Working Through It" might suggest, his personal campaign slogan, "It's Not Over", applies. Sturm draws his story in a largely realistic style, with simple black lines filled with a gray-wash of details that give events a real-world solidity. Except for one intentionally glaring inconsistency: all of these humanly proportioned people have dog heads. The choice is a familiar one, but unlike, say, in Art Spiegelman's Maus, Sturm's characters are visually fuller, with even their dog facial features sometimes drawn with naturalistic contours, making them teeter between real-looking dogs and Snoopy-esque cartoons. The effect is intriguingly odd, especially when characters are grounded in utterly human actions—how the narrator's daughter mumbles, "I'm not tired", as she sags on her father's shoulder on the way upstairs, or the wife's later, tear-clenched upset over her in-laws exchanging the gag Christmas present of a "Make American Great Again" cap. The effect is most overt when Sturm draws his couple's first romantic episode while wearing paper mâché animal heads from a summer theater production. He echoes that meta-fictional gesture in some of my other favorite moments of the novel—how the close-up of a painting purchased at a beach town tourist gallery emphasizes a general sameness in style as the larger, partially cartoon world, while also literally drawing attention to the artifice of image as a set of lines and shapes that distort and yet recognizably represent the world. That image-within-an image repeats the fake-animal-head-within-a-fake-animal-head relationship, giving the world of Off Season an almost-but-not-quite off-ness as a story drawn from inside our actual world—one in which Donald Trump is president, too. Spoiler ahead. Despite its fragmented, episodic structure, Off Season is artfully plotted, but I need to address the final chapter, one of the most intriguing of the entire novel. First, it's brilliant in its aggressive division of visual and textual narration. The title, "Watching a cat cough up a hairball during Suzie's piano lesson", subtly re-establishes a conflict-free return to the family structure in which the narrator is once again ferrying children to after-school events—a fact that gives the novel closure. Visually, the chapter consists entirely of 27 panels of a cat, presumably the piano teacher's, in the corner of a room, sometimes vomiting, but mostly just hanging out. The text, which seems to run on an intriguingly unrelated yet parallel track reveals that the narrator has gone into therapy as his wife demands, and for the first time is dealing with his repressed anger at her for an affair she had when they were newly married but that she only confessed during her severe post-partum depression, so that he had no choice but to say he forgave her. The incident is the first and only moment in the novel in which the wife is culpable, a key reversal of the marital power dynamic. Coupled with the ingeniously peculiar division of image narration and the implied improvement in their relations, the chapter would be my favorite of the novel –until the final four panels in which their recovery is revealed to be the result of their microdosing LSD. That comical non-sequitur could be a perfectly cute punchline to a shorter and far less ambitious story peopled by two-dimensional characters instead of the complex, albeit dog-headed ones Sturm has spent the rest of the novel developing so convincingly. I felt betrayed by this ending. Fortunately, four panels can't erase the pleasure of the 220-some that precede them. 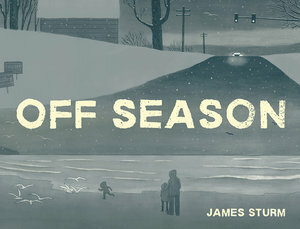 Off Season is an emotionally insightful reflection on the challenges of marriage and parenthood, as paralleled and reflected by the turmoil of contemporary politics.